My original plan was to review the second through fourth movies in THE SON OF THE BLACK MASS series, but since I’ll be piggy-backing a Naschy movie right on top of this as my contribution to the Naschy Blog-o-thon, I decided to keep it simple. So. To keep it simple. If you like action and adventure films YOU MUST SEE THIS MOVIE. This is without a doubt the greatest ever western set in 1930’s China made by South Koreans. Granted, it’s a small genre, but this film is choice on all levels. There’s this map, see. It’s a treasure map, but what kind of treasure it leads to is a mystery. As the movie opens, a high level muckety-muck is sending a messenger to deliver the map to the Japanese military (who were the overlords of this part of China — Manchuria — in the 1930s) as they cross the province in a private car on an otherwise normal passenger train. But, right after he sends the messenger he also sends The Bad, an emo bad-assed assassin named Chang-yi (played by Byung-hun Lee) to hold up the train and steal the map right back. He offers Chang-yi train tickets, but he don’t need no stinking tickets. He has a gang of assorted blackhearts, including a big mother who looks like a Samoan whose weapon of choice is frigging huge wooden mallet and a Tibetan who wears a cool-looking hat but who is obviously not the Dalai Lama. Too bad for Chang-yi, though, that he’s not the first to hold up the train. That would be Tae-goo (The Weird), the aviator helmet wearing, motorcycle riding amiable zany (Played by Kang-ho Song of THE HOST fame), who beats the Bad to the boodle. 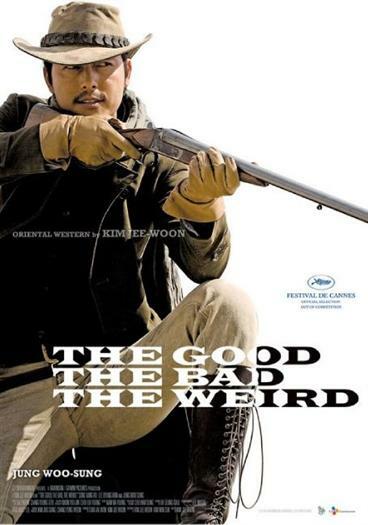 As the train robbers shoot it out, a third faction enters the plot, namely, the Good, Do-wan Park, a handsome, nattily-attired South Korean cowboy and bounty hunter (Woo-sung Jung of THE WARRIOR). And then things really start to get complicated. I’m not going to sort it out for you, because figuring out the plot is half the fun. There are the three main characters. There are at least three criminal gangs, including the Bad’s gang, another gang hired by the muckety-muck to also steal the map, and the Ghost Market Gang, a grubby bunch of low-lives who run a flea market for thieves where the Weird hangs out with his Granny and his side-kick, Man-gil, who goes rogue and introduces a fake map to the plot just to complicate things. Over-arching all is both the Japanese Imperial Army and the Korean Freedom Army (who wants the treasure to fund their rebellion), along with their assorted agents and hanger-ons, as well as some opium-smoking b-girls and a couple of adorable orphans who have a funny cameo in which they kill a man in, as a Japanese officer says, the most horrific way he’s ever seen in twenty years of soldiering. In the meantime, emo-looking the Bad, who does indeed shoot men just to watch them die, is haunted by bad dreams that leave him sweaty and shaking, and everyone becomes obsessed with the mystery of the true identity of the Finger Chopper. You’re not going to get it all the first time around. 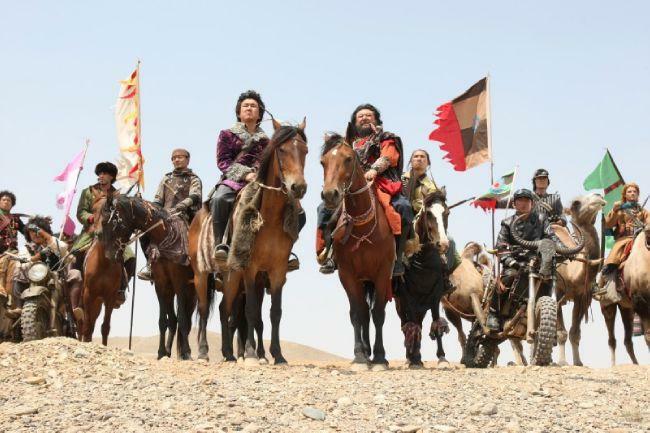 Fortunately, it’s eminently watch able with spectacular desert scenery, imaginative and innovative fight scenes (keep an eye out for the deep sea diving helmet portion of one of the gun battles), gorgeous costuming, and an outstanding soundtrack that is a driving combination of Latin and Asian musical tropes. But don’t take my word for it. THE G, B, & W nabbed eight nominations in the 2009 Asian Film Awards, and walked away with four wins: Woo-sung Jung (the Good) for best supporting actor, Kang-ho Song (the Weird) for best actor, Mo-gae Lee for cinematography, and Dalparan and Yeong-gyu Jang for best composer. 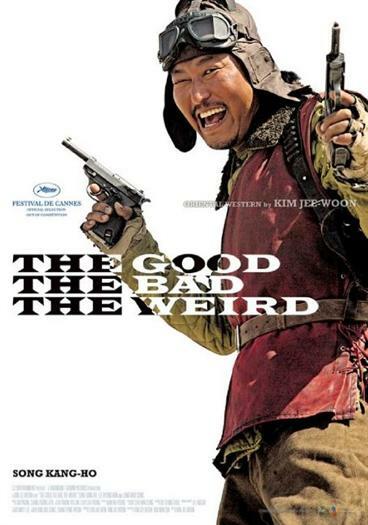 Also getting nominations (and, really, getting nominated is the real honor) was Ji-Woon Kim for director, Byung-hun Lee (the Bad) for best supporting, actor, as well as nods in the best visual effects and best film categories. This movie rates a solid 10.